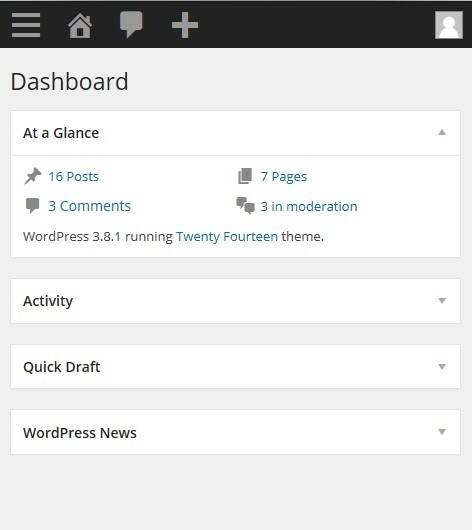 Once you login you will arrive at the WordPress Dashboard. 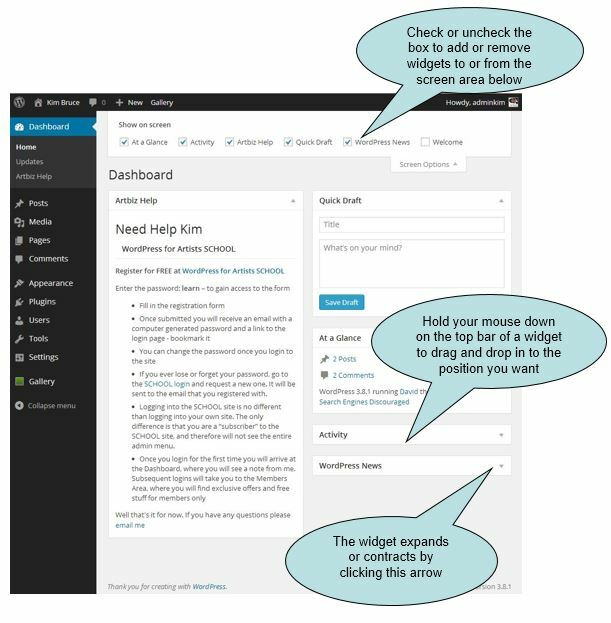 The Dashboard gives you an overview of your site with widgets, screen options and the main admin menu on the left. You can organize dashboard widgets to suit your needs by turning them off or on under the Screen Options tab (shown in the open position in the image below). You can also move a widget by clicking and holding your mouse button down on the top bar of the widget and dragging it around. To collapse a widget, simply click on the right hand edge of the bar where you’ll see an arrow appear. The Screen Options tab also rolls up and down by clicking the tab. On the left hand side, is your administration menu with links to Posts, Media, Links and so on. What you see here will depend a lot on how your site was set up. 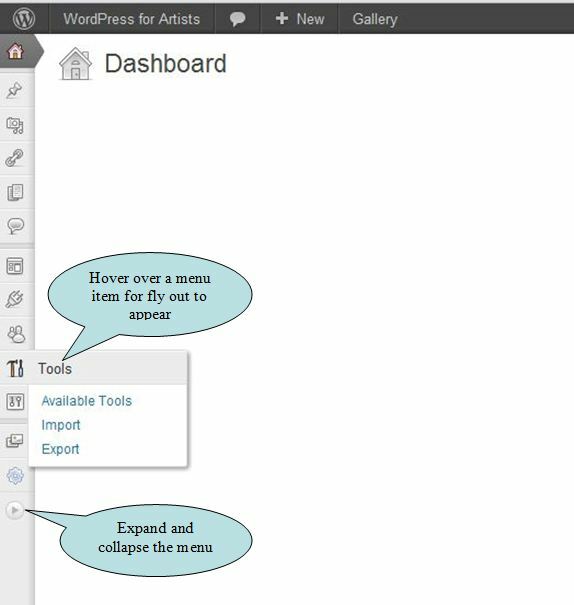 For instance if you do not use the blog features of WordPress, then Artbiz will hide these menu items so they’re out of your way. The admin menu expands out when you hover your mouse over an item, and will show sub pages in a fly out. The quick reference below shows the menu items with a brief explanation alongside. Condensed admin menu. By popular demand we can moved items that are hardly ever used out of your way. Look under Tools and Settings if you think something is missing. The new fully responsive design makes it easier to work on your website from a variety of mobile devices. 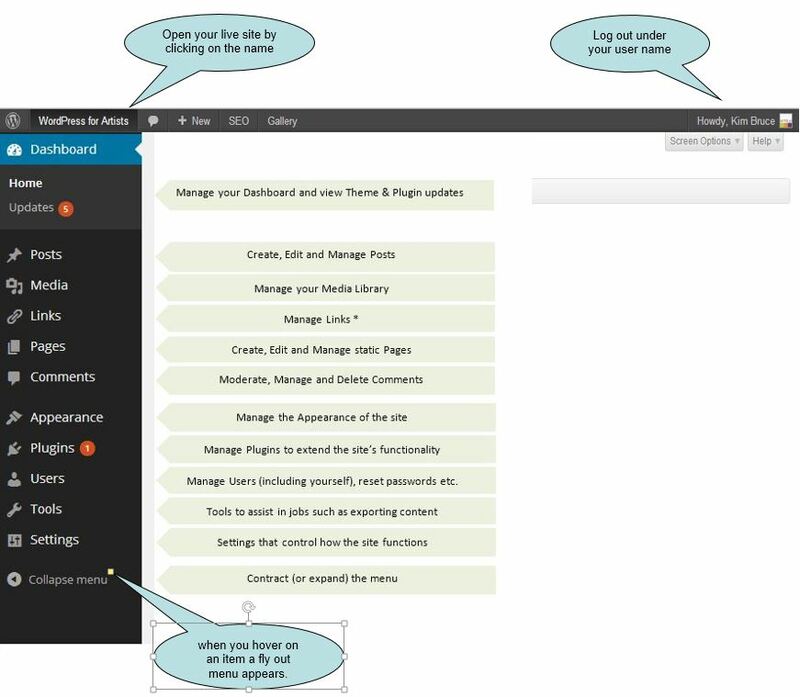 At the top of your live WordPress site and in the admin area you will see the toolbar. By default, this is only shown when you are logged in and browsing the website and it can be switched on or off by visiting your user profile and checking the box shown below. 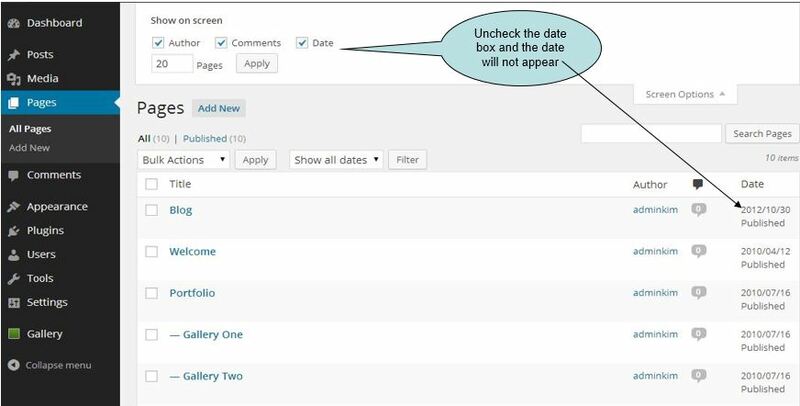 This will only turn off the Toolbar on your live site but will remain inside the admin area. The toolbar provides quick access to the administration area. Posts, Media, Pages, Links, Comments, Plugins and Users all have screen options where you can chose what is displayed so you can reduce clutter. If you think that you do not have access to a certain feature remember to check your screen options. There is also a different set of screen options when you are inside the page or post editor. The screen options tab on the far right of the “Show on Screen” box expands or retracts the screen options. You have access to the Dashboard of this site. Since you are a subscriber to this site you will notice that there are not that many menu items or widgets on the Dashboard. But you can play with the drag and drop features and show and hide the widgets from the screen options tab. You can play with the Dashboard right here on this site, or try it out on your own! Click on your name at the top right corner, where it says “Howdy,…” to get there. One of the first things you may want to do after you login to your own site and tour the Dashboard, is to change your password under Your Profile. Let’s do that next.